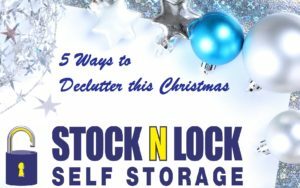 Getting everything ready for the Christmas period can be a very daunting task, so here at Stock N Lock we’re here to help you along the way. Christmas can be a stressful time of year for most people; however being surrounded by mess and clutter often increases stress levels as you are likely to feel out of control and anxious. If you get organised and declutter you will feel calmer and happier in your home once again. Are Auntie Sally and Uncle Richard paying a visit this year? Worried about what they will think of your home? Or thinking of asking them to stay at a hotel? So many of us suffer from what has been coined ‘Can’t Have Anyone Over Syndrome’ (CHAOS) as we’re embarrassed of our homes due to clutter. It’s time to clear that spare room and welcome everyone over. Rearranging your possessions will enable you to make money from those unwanted items by selling them. You will also stop buying duplicates of items as you will be able to see what you already have in your home. Being organised will also stop you from over buying homeware items as you will want to maintain your hard efforts of decluttering. You will also want to spend more time at home meaning less money spent on dining out. Home will finally be a place you can relax and unwind without having to worry about what’s going to happen to those boxes in the corner of the living room. You’ll be able to have friends over without worrying about the household mess! Sorting out items will give you space and a new lease of energy which will impact other areas of your life. Throwing away those old items or storing cherished ones can be very liberating and can be great for your mental well-being.